People in North East India are very much conscious about Environment. Their love for nature inculcates in them a strong sense of preservation and conservation. However, for their need and want they have always used the Mother Nature. Their lifestyle and culture all has expression and portrays their love for nature. They have coexisted with nature which is evident in their songs and dances. All symbolizes a meaning in itself. The humble and hospitable people of Garo Hills in western part of Meghalaya are equally conscious about nature. A vast area of forest cover has been reserved by the village itself. In this part of the country there is a practice of Nokmaship. Nokma is the custodian head of the land called A•king. The Nokma is responsible for distribution of the land use for harvesting. The most prevalent practice is the jhum cultivation. Whatever it be, the Garos' have a unique knowledge about land use and preservation. Though the forest cover over the years may have declined, still fast stretch of the land is covered with deep dark forest. And the region is a perfect example of a green forest cover. Garo Hills is rich in water bodies. The longest river in Garo Hills is Simsang. Simsang River originates from Nokrek. It is situated at an altitude of 1400 metres above sea level. It's a buffer zone and the place is known for its rich citrus gene pool. The famous citrus indica, known locally as 'me•mang narang' is found in abundance here. It covers an area of about 47 sq km. Nokrek is a national park and a biosphere reserve. 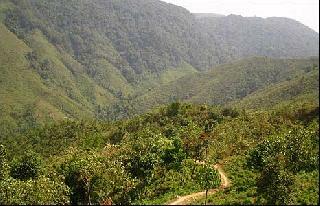 This place is located at about 45 kilometres from Tura, the district headquarter of West Garo Hills. At the foothill of the Nokrek is located the beautiful hamlet of indigenous Garo people. Chidekgre, Chandigre and Sasatgre are the villages in this range. People living in this hill are very hospitable, warm and welcoming. The climate round the year is pleasant. Simsang flows through the East Garo Hills and South Garo Hills Districts. It has a vast plain land along the bank, where the Garos made their last major resistance to the British intrusion into Garo Hills, during the year 1837. The notable attraction on the banks of this river includes Sisolbibra, Siju Caves, Baghmara, Simsangre et al. The river eventually enters Bangladesh. 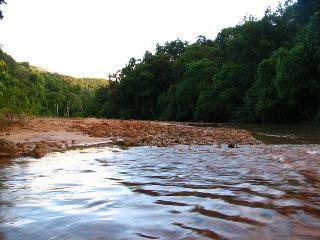 This river is a threshold of unique fishes indigenous to this region. The river, as it passes along various courses springs up to a beautiful waterfall, of all shades, which has a unique tale of its origin. Songkalwari in the bank of river Simsang is evident of the rich conservation knowledge of the Garos'. Many such pools locally called wari is found in Garo Hills where the fishes of different variety are preserved. Some of the exotic variety of the fishes are locally known as na•rong and na•kachi. The electric fish (eel fish) known as na•nil is also found in such wari. Selbalgre, a village in the foothill of Nokrek is another example of Garos' rich knowledge about conservation. The only taleless ape species in India Hoolock Gibbon is found here. And the locals have declared the place as a Reserve. The community protects this reserve. People violating any rules are imposed with fine. The sacred grove in the reserve is the pride of the village. The Garos' never kill or hunt the Hoolock. It is locally known as huru. They have a traditional believe that if it is killed, a famine or a curse would befall in the village. 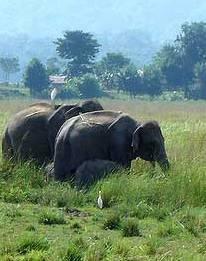 Balpakram now a National Park is a living testimony of the vast green cover of Garo Hills. The place has many stories of myth and mythology. The Balpakram National Park is located to the extreme of South Garo Hills, at a distance of 90 kilometres from Baghmara. This pocket of pristine beauty is close to the international boundary of Bangladesh. This park aptly known as 'The land of eternal wind' in the local Garo language is shrouded in mystery, soaked with charms, breathtaking scenery, amazing variety of wildlife, magnificent and charming tribal lore, legends, beliefs and sentiments. In the bank of Simsang, the longest river of Garo Hills which enter Bangladesh from South Garo Hills. This park with its vast elevated variation supports a profile of various types of floral and faunal compositions. There are perhaps very few places in the whole world where such a unique concentration of immense numbers of flora and fauna occur, in such a small area. Elephants and tigers are the flagship of the park. Hoolock gibbons, the only ape species found in India can also be seen here. Other animals found in the park are deer, great Indian hornbill, pheasant, wildcats, wild cows, wild buffalo, leopards etc. Among the plants very rare species like pitcher plants (Nepenthes Khasiana), orchids and drosera flourish abundantly. Agar (Aquillaria Agallocha) is another endemic plant, which enriches the flora diversity of the park. Balpakram has its own importance for the Garos and Hindus alike. Literally, Balpakram means a place of perpetual wind and according to Garo mythology it is the abode of the dead spirits. Garos believe that, when a person has discarded his earthly vestures the spirit journeys to the land of Balpakram, where it dwells temporarily until its final journey. It is also believed by Hindus that Hanuman, while looking for the herb 'sanjeevani' to cure Laxman, who was injured in the battle against Ravana found it in Balpakram. He took the top of the hill from Balpakram leaving a plateau or flat land in its place, which is today known to the Garos as Chitmang Peak, the highest point in South Garo Hills. This place is located about 135 kilometres from Tura. Chitmang to the Garos is the final resting place for all spirits from where there is no return or rebirth, since Balpakram is only the temporary abode of the spirits. The Attongs, a sub-tribe of the Garos call it (Chitmang) Wai-mong, meaning the dwelling place of the great god, who gives life and also takes it. The place is also sacred among the Hindus who revere it and call this hill, Kailash. Langurs, birds of different species, elephants etc inhabit this thick forest.